Previously we already saw that the BlackBerry Z30 made its appearance in several leaked images on the internet and once again, there are more online live photos leaked of the upcoming smartphone. This time, the leaks also show the Z30 along with Z10 and Q5 as a quick family snap. 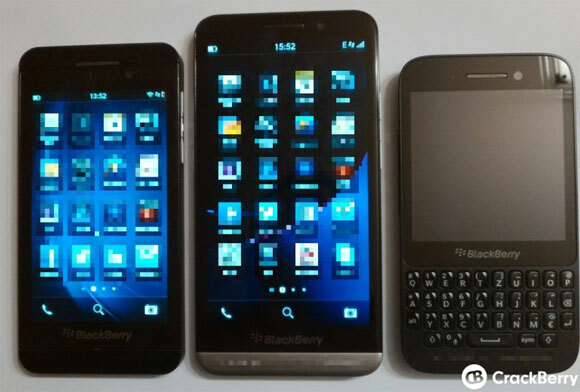 As seen by the leaked images, it is confirmed that the BlackBerry Z30 is much bigger as compared to the Z10 and it shares much of its design from its early predecessor Z10. There is hardly any difference between the two smartphones and it would be entirely similar in every way if there wasn’t a silver accent on the bottom of the phone or a bit larger overall body of it. Other than that it was a hard time telling the two apart. According to the previous leaks, the BlackBerry Z30 is also known as A10 and will not feature a lot of specs bump. However it is expected that the new upcoming BlackBerry Z30 will be powered by a Qualcomm chipset and it consist of two 1.7GHz Krait cores for more processing power than the previous models. Other than this, it will feature a quad-core Adreno GPU and 2GB of RAM. The main difference of the smartphone is the front screen which has a 5″ OLED display of 720p resolution as expected. This might be the first phone from BlackBerry to officially have an OLED display. Previously reports have suggested that Samsung is also looking to adapt this OLED display for its new Galaxy Note 3. The BlackBerry Z30 is going to be running on the BlackBerry OS 10.2 version as the leaks say. The new release is said to bring the entire new settings panel. Other than this, there is also going to be an accessible via a swipe down from the top of the device screen. And due to the increased size of the screen of the device, the users are likely to see a 5 row of icons fitted on the app drawer. The normal row of icons that is shown is 4 because of the screen size.